For this month's Fabric Mart blog, I choose this gorgeous textured knit in coral--this is one of my most favorite colors to wear! Julie also asked if I would be willing to try this new pattern by Angela Wolf, called the Rachel Twin Set and after checking it out, I was delighted to say yes! So before diving into this lovely fabric, let's talk about the pattern. This is a multi-sized pattern and it ranges from XXS to XL for one sizing option and XXL to 5X for the other. I carefully checked my measurements to the sizing chart and read through Angela's suggestions on choosing your size and the amount of stretch your fabric has. My fabric was a more stable type knit so I choose a large size for comfort and ease of wearing. I also made a muslin as this is my very first Angela Wolf pattern and her sizing is a bit different from the big 4 pattern companies. Angela has all sorts of suggestions for modifying this pattern to your personal taste. I decided to make it 'as is' since I like the overall length and styling. The sleeves are really nicely drafted! Look how well they hang! I love how the upper back fits with this pattern and in this knit. The sleeves are the perfect length as well. I left off the ruching on the sleeves as I really didn't think it would look that great with a textured knit. So this is the 3/4 sleeve length sans ruching. Just perfect in my book! That cascading part down the front is achieved by having the front lower panel extend past the bodice. You join this piece onto the front band. You can see in the above photo how that piece is attached and how it makes the cascade. I rolled hem the edge and used a variegated thread so it had a bit of fun! It is a subtle effect but I really like it! You can also see the texture in this pretty fabric! 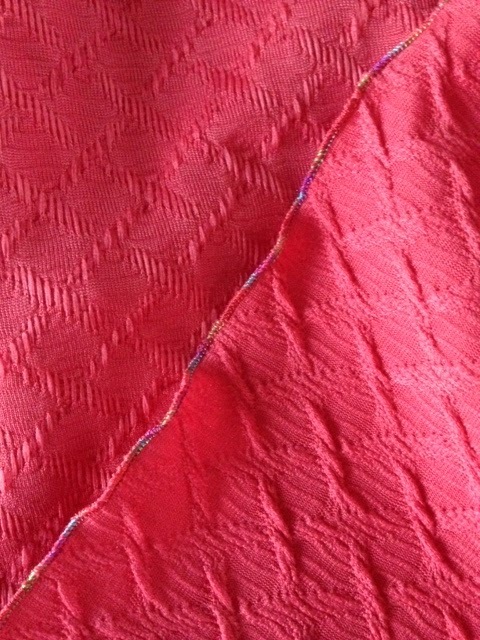 Below is a view of the right and wrong sides of the fabric. In case you are wondering, here is how the tank fits. I just love that there is no gaping at the armholes and no bra showing! The neck band is really well drafted and lies nicely against your chest. This is so work-appropriate I am giddy about it! I didn't use any variegated thread on the tank. I choose to keep it super simple and use matching thread and a triple stitch to keep the banding seam in place. For the lower hem, I used Emma Seabrooke's stay tape, 1/2" wide. It pressed beautifully onto the fabric and made hemming easy-peasy! Here you can see the other side of the tank and it is the same--no gaping or bra showing! I also don't mind that the tank is snug. I intend to wear this as a layering piece. And also note how the back of the tank snugs up to my neckline. No gaping! This fabric washed and dried just beautifully! I love textured knits! Thanks for reading and I do hope you'll try this pattern from Angela. I think it is a winner! Pick up some of this pretty fabric too, you won't regret it! You can find the Rachel Twin Set HERE. Double knits like this one can be found HERE. You will be even happier the next time you make this pattern if you use your muslin to correct for your swayback issue that is causing the wrinkles across the lower back. It is simple to do. Just pinch out the fullness as a horizontal dart starting at center back and going to nothing at the side seams. Make this correction as needed to the muslin and transfer the changes to your paper pattern. That will correct for the excess length you don't need that causes the wrinkles. This is really pretty, Sue! I love the combination of the coral with the white pants. Thanks for pointing out this pattern!